Cellhire plc is proud to announce that it has been awarded the Investors in People accreditation. The York based telecomms company achieved the national UK standard, which awards organisations for their commitment to the development and training of employees to achieve business goals. This achievement further reinforces Cellhire’s belief in achieving its goals through quality people and its commitment to delivering customer service of the highest standard whilst retaining its position as the world’s leading mobile solutions rental company. Investors in People is the national standard which sets out a level of good practice for staff training and development to help businesses achieve their goals. The achievement of an award such as this reflects the best people practices of an organisation and helps to increase competitive advantage through improved business performance. 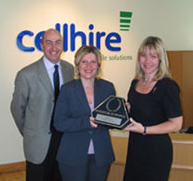 The Cellhire management team fully endorsed the benefits of IIP status and gave a commitment to achieving the accreditation. Having achieved the Investors in People standard, Cellhire will now work to develop a framework for improving business performance through relevant staff training and development. This not only facilitates effective working practices, but will also ensure all Cellhire clients receive customer service and support of the highest quality. Established in 1987, Cellhire is the world leader in mobile phone rental. The Company has operations throughout the world in locations across the USA, Europe and Australia.